In 1972 two seconds were added to time, to bring the clock back into line with the movement of the earth. Now two seconds might not seem like very much at all, but they could be very important. Byron was eleven years old, and he knew that. He was right, of course. Two seconds can make all the difference; for better or for worse. Byron and his best friend James talked it over. James was sure that everything would be alright but, though Byron had great faith in his friend, he continued to worry. And what happened one morning, when his mother was driving Byron and sister his sister Lucy to school, proved him right. He saw the second hand of his watch go backwards and then it happened …. Diana, Byron’s mother didn’t even notice, and so once again Byron consulted James. They launched ‘Operation Perfect’ to analyse what happened, to manage the repercussions, and to make things right, as they had been before. But they find that things that happen, things that they do, can have unforeseen and unmanageable consequences. ‘Operation Perfect’ changed everything. For ever. I loved watching Byron and James. I cared about them, and I worried about them. I wanted to reach into the book and guide them, but of course I couldn’t. But this is really Diana’s story; she was its emotional centre. She was plucked from life as a performer to become the trophy wife of a successful man. A man who seemed to give her everything but his time. She didn’t care for the society of competitive, middle-class mothers, the things that her husband thought important didn’t interest her at all, and at times she struggled to hold on. But she loved her children, she came into her own as a mother, and that was so lovely to see. ‘Operation Perfect’ could make her or it could break her, and my heart rose and fell as events unfolded. The story was both profound and moving: one for the heart and the head. The second strand was set in the present day, and Jim was trying to get back on his feet, but it wasn’t easy. He had mental health issues, he’d been in and out of institutions, but he had a job and he was living independently. Could he stay on his feet? I really hoped so, and it was lovely to see him find friendship and support can come from the most unlikely of places. He saw new possibilities. But could he take them? Jim’s story is beautifully observed, and told with such understanding. I knew that the two stories must be linked, but I didn’t think too much about how. I was too caught up with the characters and the story, and I had every confidence in the author. This book is a step forward from ‘The Strange Pilgrimage of Harold Fry.’ It’s more sophisticated, more profound, and it speaks so very, very well of what it is that makes us human. The characters and their relationships are beautifully drawn, their stories are cleverly and elegantly constructed, but most of all this is a wonderfully readable book. Their are so many wonderful details, but I’m not going to spoil them. Because this is a story that can touch your head, your heart and your soul. « Welcome to Independent Booksellers’ Week! Another one to look forward to…I’m very drawn to the cover. It was a tough book to read as it did have so much to it, and that is perhaps why it was tough to review. Thank you for sharing your thoughts. 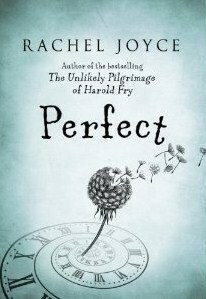 I adored Perfect, from the cover to the characters. Joyce’s characters are something special and the moment where everything changes (towards the end when ‘they’ meet) took my breath away. Looking forward to reading this too, great review. This sounds lovely and has such a beautiful cover too. I agree that the dual narrative structure is used too often so it’s good to know that it worked so well in this case. I adored Harold Fry, and think I’ll also adore this one. Thanks for the great review.